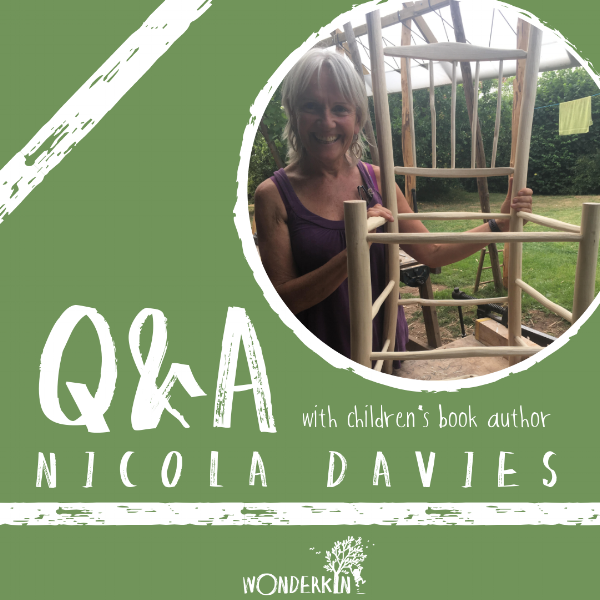 Our author spotlight this month is on Nicola Davies, whose book White Owl, Barn Owl is featured in the Wonderkin Owl Box and on our list of "Eight Great Books About Owls To Support Nature Based Learning." What is your favorite outdoor childhood memory? Wow…so hard to choose as I spent ALLLL my time outdoors when I was little. But certainly one of my favorite things to do was body boarding on the beautiful beaches of west Wales…I adored being in the water and the feeling of the waves pounding my body as I raced over the sands on my board. I would stay in until I was blue with cold. And I still do it. Before you began writing children's books, you were a zoologist. What was that like and how did it shape your world view? I was born a zoologist. I don’t remember a time when animals weren’t my primary fascination, so studying zoology at university and then writing about it was just a natural extension of that. I think a respect and a love for the natural world is deep within all human beings, and its something we need to revive and reconnect with its essential to our health and well being and to the continued health of our planet’s life support systems. Being a passionate reader as a child! Creating a narrative that engages, charms, challenges, captivates and educates is a privilege and Im thrilled to be able to do it. What was the most surprising thing you discovered while researching White Owl, Barn Owl? That you really CAN call them with a kind of high pitched squirting noise that you can make by blowing a raspberry into your palm. Ive tried it a few times when Ive been lucky enough to see barn owls and it works so well, its like having a super power. Peek Inside "The Owl Box"